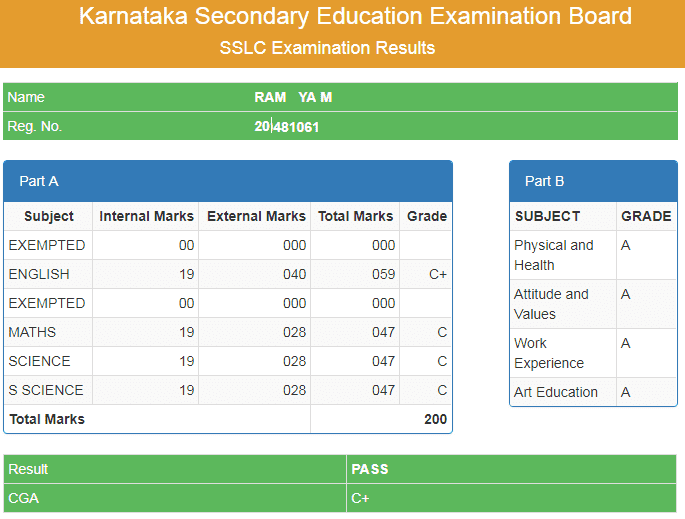 Karnataka SSLC Supplementary Result 2019: Conducted by Karnataka Board of Secondary Education (KSEEB). The board has ventured to conduct the supplementary examination for the failed candidates of the examination of March in June; this enables the students who are successful in the June examination to join higher education courses in the same academic year. This process was introduced the first time in the country. September /October of each year for the failed candidate of the 1st year. The Theory and Practical Examinations will be held in such Centers as may be opened by the Board from time to time and as may be intimated to the institutions concerned. The regular Examinations shall be conducted generally in March/April and the Supplementary Examination shall be conducted generally in May /June every year. (i) Written questions which they shall be required to answer in writing. (ii) Practical tests as provided for in the syllabus. Candidates who have successfully passed the *Karnataka S.S.L.C. Public Examination in full, shall be eligible within two years to appear for the Examination by private study or as a school candidate, in part or parts in which he/she has already passed, with a view to obtaining a Supplementary Certificate with the same subject/subjects, already offered, on the previous occasions or with changed subjects under languages and electives. The Original result in the subject/subjects so offered will continue to remain unaltered even if his performance in the subsequent attempts is poorer than in the original attempt. After the publication of Karnataka Board of Secondary Education (KSEEB) SSLC Result 2019 Karnakata. The students apply for the Supplementary examination. This is the simplest way to any board result online. Check the steps below. Click on SSLC Supplementary Results.